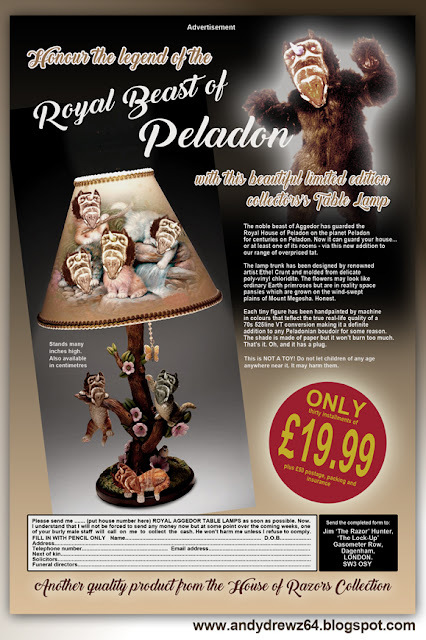 Andydrewz's Pages: The Royal Beast of Peladon Official Lamp! The Royal Beast of Peladon Official Lamp! Light up your bedroom with this. Labels: A bit silly, aggedor. Jon Pertwee, Collectables, Collector's Items, Doctor Who, Fake Merchandise, Table Lamps, TAT, TV nostalgia. "Terrahawks! Stay on this Channel. ZD21 is Go!!!" Whovians in Love - volume one..
John Shaft versus Jon Pertwee!